The music industry's biggest stars gathered at the T-Mobile Arena in Las Vegas on Sunday for the 2016 Billboard Music Awards. Everyone from power couple Blake Shelton and Gwen Stefani to Kesha graced the stage for the annual event. Here's a look at the big winners of the night. The Billboard Music Awards were filled with incredible performances and inspiring wins. Blake Shelton and Gwen Stefani shared an onstage duet, Madonna sang "Nothing Compares 2 U" in tribute to Prince and Kesha received a standing ovation amid her ongoing battle with Dr. Luke. Celine Dion gave an emotional performance, her first following the death of her husband, René Angélil. Britney Spears opened the awards show in a racy outfit and iconic headset. In addition to winning the award for Top Artist, Adele won Top Female Artist and Top Selling Song for her album "25" and song "Hello." Adele's net worth is $125 million. She reportedly has signed a $130 million record deal with Sony -- the largest contract ever for a British musician. Justin Bieber is officially back, winning both Top Male Artist and Top Social Media Artist, thanks to his new album, "Purpose." His newest record sold more than a million copies within weeks of its release, reported CNBC. It includes hits like "Sorry," "Love Yourself" and "What Do You Mean?" Justin Bieber's net worth is $200 million and counting. His Purpose tour -- which he's in the midst of -- has already earned $40 million, according to Billboard. Top New Artist Fetty Wap's self-titled inaugural album debuted at No. 1 on the Billboard 200 albums chart and has sold more than a million albums to date. Fetty Wap's net worth is $8 million. The Weeknd was the biggest winner at the Billboard Music Awards, garnering a total of eight honors, including Top Song Sales Artist, Top R&B Song, Top Hot 100 Artist, Top Radio Songs Artist, Top Streaming Songs Artist, Top R&B Artist, Top R&B Album and Top Streaming Song (Audio). His "Beauty Behind the Madness" album has sold more than three million copies, featuring hits like "The Hills" and "Can't Feel My Face." The Weeknd's net worth is $10 million. Rihanna was honored with the Billboard Chart Achievement Award, which was voted for by fans. Her latest album, "Anti," has sold more than two million copies and her single "Work" was certified triple platinum in April. Rihanna's net worth is $160 million. Keep Reading: Bad Boy Family Reunion Tour Kicks Off in Brooklyn, N.Y.
All net worth figures are according to CelebrityNetWorth.com unless otherwise noted. 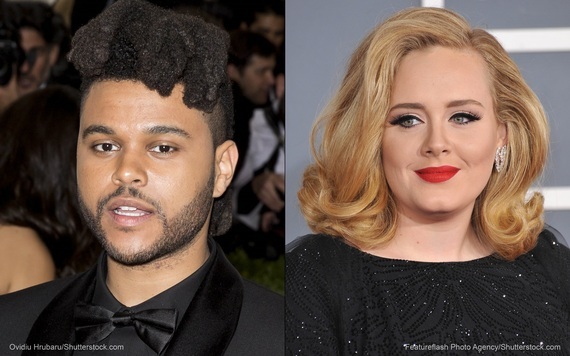 This article, Billboard Music Awards 2016: The Weeknd Net Worth, Adele Net Worth and More, originally appeared on GOBankingRates.com.